that speaks words, not only numbers, and does not adapt to geo-political and economical needs. 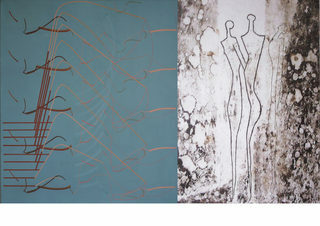 UniverseTaal will show you works (drawings, paintings and prints) deeply related to the human universe. Or rather... you're looking at my life. I don't portray any recognizable images. That's exactly why I'm always asked for explanations or one or two clarifying paragraphs. You're a master in art history... or quite the contrary... you are at the top of your vigor... or just a bit absorbed... that's where the space is. I graduated in 1987 at the AKI, Art Academy in Enschede, the Netherlands. Eversince I never stopped creating drawings and paintings. I am happy to show my paintings here at the Breed Art Studios. They are shown publicly for the first time. Jacob Kleyn: My work is about people, their relationship to themselves, to each other and the environment. It's about the tension / voltage line between them. and descending deeply into my own self. In my works I express this in a simple way, using different materials. The work connects the personal emotional existential 'condition' with the humanitarian conditions in the World. as a result, touches the empathy feeling closer and more intensely.